I fell in love with leeks last March while in London visiting, in part, my friend H. We went to her local Marylebone Farmers’ Market and picked up piles of fresh leeks and kale. I have wonderful memories of standing in the kitchen with H, listening to Ingrid Michaelson, and cooking mountains of sautéed kale and leeks. Anyway, I spent some time browsing the interwebs last night for leek recipes; I knew I could just sauté them and they’d be delicious, but I wondered if any of my favorite recipe sites/blogs had interesting recipes. Lo and behold, smitten kitchen has a great-looking ginger fried rice recipe that uses leeks. I adapted the recipe a bit to suit my style and available ingredients. It turned out deliciously. The fried egg on top is a must. Heat your oil of choice (I use sunflower oil here in Ukraine) and saute the garlic and ginger over medium heat until they are brown and crispy. Add the leeks and season to taste. 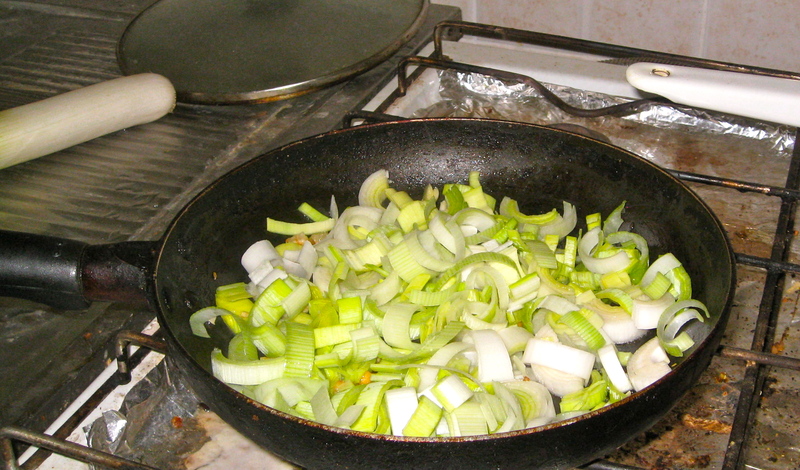 Cook over low-medium heat until the leeks are tender but not brown. Add the rice to the pan and sprinkle with soy sauce to your taste. Stir often so the rice heats through. While the rice is heating up, fry an egg sunny-side up in another pan. Serve fried rice with the egg on top. This entry was posted in community, food, health, pictures, travel on 11.10.2012 by taplatt.